- DEVELOPED specifically for hydraulic boom systems, BoomSafe represents a leap forward in remote operation technology, significantly improving uptime for operations. 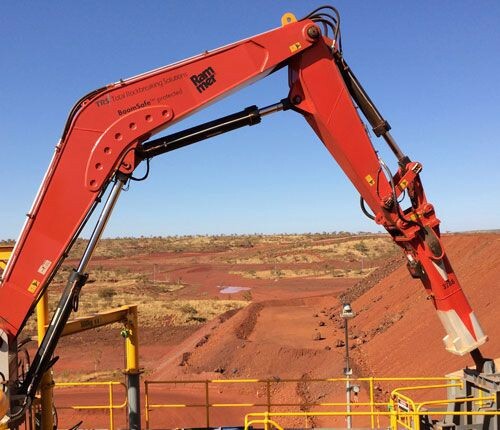 Recent installations in the WA Pilbara have proven that BoomSafe is the most reliable and cost-effective rockbreaker boom automation and remote operation system available in the market. With military-grade position sensors mounted in heavy duty housings fitted to the boom, stick, and rockbreaker as well as a rotary encoder to determine slew location, BoomSafe is able to determine the precise orientation and position of the boom system at all times. Together with the Automated Collision Prevention System that monitors the boom's allowed range of motion, BoomSafe supervises and authorises all boom movement commands from the local radio control or remote operation system to avoid damage to the boom and surrounding infrastructure. 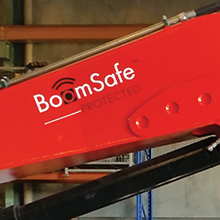 "BoomSafe's Operator Assist function provides a great advantage over other systems on the market because it can automatically correct and adjust the human operator-initiated movements to direct the boom back into the safe work area, instead of halting the boom operation and requiring further operator intervention to continue," Total Rockbreaking Solutions engineering manager Paul Ingleson said. Automated movement commands such as 'Park', 'Deploy', 'Tool Replacement Position', 'Rockbreaker Change Position' or any other common or difficult movement sequences can be configured and modified by maintenance staff onsite via the intuitive touchscreen. Operators can execute the automated movements with a single button press, improving speed and precision. For example, when parking on a small platform, BoomSafe reduces the chance of equipment damage that could easily be caused by operator fatigue or error. BoomSafe can also be integrated with other sensor systems on site, such as perimeter safety gates. In addition, it has configurable inputs that can be set up to operate other plant equipment, for example, opening and closing a crusher cover. "BoomSafe's advanced technology significantly improves uptime because modifications and maintenance can be completed on site without specialist technicians or TRS staff. Site maintenance staff can set up and modify BoomSafe movement sequences and adjust the allowed area of operation when needed." "BoomSafe sensors are mounted separately to the boom hydraulics and if maintenance is needed they are easily accessible and can be replaced in minutes using hand tools," said Paul. "Our customers can take advantage of efficiencies available through the use of the latest technologies in control and automation," Paul says. "BoomSafe has been designed with true multi-operation in mind, allowing a single Remote Module application to control multiple rockbreaker boom systems from a single central location." "For larger sites, multiple workstations can share control of a group of booms on a first-come, first-serve basis. Each boom system can be assigned a unique remote operation password for security to prevent unauthorised access".Mr Ingleson said the BoomSafe had also been designed with true multi-operation in mind, allowing a single Remote Module application to control multiple rockbreaker boom systems from a single central location. "BoomSafe is available factory fitted on new Boom Systems however, our customers can benefit from BoomSafe efficiencies immediately without purchasing a complete new boom system as BoomSafe can be retro-fitted to their existing boom regardless of the brand." "All commissioning takes place via an easy to use touchscreen and requires no specialised software, controls equipment, 3D modelling or CAD data. Once the hardware is installed, full configuration and testing with access to a non-isolated boom system can be done in less than a day." Paul concluded. BoomSafe is registered trademark and available exclusively through TRS.